7 and 23. I was born on 07/23/1977 so you can see why! Thanks for the fun giveaway. OO this sounds fun! . I love to create and I'm always in my studio. My number would be 7. Seven has come with all things good in my life. My son is 7 and this year has been the best year for my family. And 5 for the fth house in the astrology > This is the house of creation of art and culture. My favorite numbers are 22 for my daughter's birthday and 23 for my grandfather's birthday. Thanks for the giveaway!!! i have always liked the number 5... and when i was a kid i thought i wanted 5 kids haha... little did i know huh? but then my daughter was born 5 31 95 .. so i cont to like 5 .. i also like to use our birthdays.. 9/4 and 5/31 when i play the lottery ... :)... hope i get lucky with this lottery... thanks mindy!!!!!!!! I have honestly never given any thought or notice to having special numbers that pop up in my life, but I'm sure going to start paying attention and see what they are! Hmmm.... I've never thought about it but, now that you've got me thinking, it's the number 3. I was born in March, the 3rd month of the year. My son was born 1/3/08 and my daughter was born 4/13/09. Lots of 3's going on there! My special number has always been 21 because of the jersey number of my favorite soccer player when I was young! I don't really have a favorite number either. When I use numbers in my art I generally choose the current ages of my 2 boys. They are 7 and 5. I'm so excited for next year. :) I have to say my number is 2 since it's the month I was born. My lucky numbers are 6 and 13... These numbers come up in my life over and over and over. <3 Thank you for this giveaway!! My numbers are 9 & 13. I'm not really sure why! Thanks for the chance to win! My special number is 22. I have seen it everywhere for about eight years now. I take it as a sign from the universe that everything is working out. My nos are 1 and 5, 1 because I was born on 1st. and 5 because the total of my birth date adds up to 5 (1/3/1972) and the no 5 keeps popping up like my house no is 122 which is a total of 5 and so on. Thank you for the giveaway and an awesome opportunity to join the Lifebook 2013. 11 and 28, because they are my birth date but also because I often seem to check the time at exactly the moment of 11:28, morning or evening - it always gives me a bit of a jolt! My favorite number is 9...symbol for peacemaker. Sounds like an awesome workshop! My favorite number is 7. I don't know why, it's just always been 7. Lucky 7. 7 days in the week. 7 was a fun age. I think I was just born with that as my lucky number because I don't remember thinking of it on my own! My favorite number is 40. My Basketball number was 40...I did a 40 day fast when I was in my 20s...two years ago I had leukemia and a bone marrow transplant and I celebrated my 40th birthday this spring by going roller skating with 50 of my friends. I am so grateful to be alive! Being 40 is awesome! I've always had a special spot for 7. It seems like most of my friends and family have birthdays on 7th, 17th, or 27th, which is a little odd, and I think it's fun. I also really like 3; I'm big on trinities - religious, musical, artistically. They feel right. 007 which is my Difference Maker number in the Rick Hansen 25th Anniversary Relay. Apparently I like 2's and 7's! I like Leonardo da Vinci's favorite number...72. I just love the mystery of it. Growing up my lucky number was 7. I still like it, but now I also like 13, I don't think it's unlucky. However, a number that I really feel something when I see it, which is often, wether in the night when I wake up and look at the clock, or driving in the car, etc. is 333. I looked up the meaning and its supposed to mean I'm completely surrounded, protected, loved and guided by the benevolent ascended masters. When I was young, I thought my lucky number was 7, like everyone else! Now I know my number is 2! There have been 2s in many significant dates, addresses and phone numbers. I like number 4 and number 6. I am not sure why but these 2 numbers seem to come up a lot around me. I also like 11 and 22. How fun! Thank you so much for the chance to win a spot in Life Book! My special numbers are 3 and 13. My late grandmother who holds a very special spot in my heart was born on the 13th, and my 1st daughter was born on her birthday. My hubby and I decided to marry on Friday the 13th, and we continue to see the number pop up in our lives. :) 3 is also special.. not so sure why, but for one my 2nd daughter was born on the 3rd, and I just feel it to be a "complete" number. Many things seem to come in 3's for me! My number is 12. I don't know why it just speaks to me, always has. I was so happy to see that your were teaching in Life Book this next year! I really love the number 5. I think it is because that is the number of people in my family including my dog. :) Thank you for a chance to win a spot Mindy!! yay! omgosh, how exciting! my number is 7, and there are others, but not as omnipresent as 7. Hmmm...this is an interesting question, Mindy...one that I haven't really given much thought to. I have a fave shape, the heart & a fave element, water...but not a fave number. My husband's is 12, my son's is 13...& well, I'm not sure I truly have one number that resonates in a way w/ me as numbers do w/ others. My numbers are 3, 12, 21. My birthday is 21 and my son's is 12. Threes (or sixes and nines) always pop up in my life. Thanks for the opportunity to win this class. 27...for my birthdate! thanks for the giveaway..so exciting! Maybe 3, because after 3 Semster, i ont know the english word sorry, i got a seat in my university. This sounds so amazing! Thanks for the chance to win! My numbers are 3 and 9. They are in my birthday and they continue to pop up in other area's too. They feel so much a part of me. Yay! Sounds like fun! My favorite number is 27, for no other reason than I like the way it sounds. I always use it to be silly, by saying, "I did that 27 times" or whatever. It's my go to number when I am exaggerating. Thank for this chance. I can't wait to start 2013 with you and my 2. Lifebook. My number is 8. First of all it's my birthday and part of my birthyear. And if you flip it, you have my favorite sign, the neverending sign. AWEsome Mindy. My number has always been 7, but I think my favorite is the Fibonacci sequence for it's beauty and natural occurrence in nature. My favorite number since I can remember is 22. Even my husband's birthday is the 22nd. Hey, today is the 22nd. Maybe a sign that I will win. I have always been drawn to the number 4. I was born on 4/14....I guess that could be why...haha! My numbers are 13 and 17. 13 because I was 13 when my baby sister was born, she was 13 when my first child was born, and my daughter was 13 when baby sister's first child was born, and believe it or not, that child, my niece, was 13 when my first grandson was born. 17 because it was the year I learned to be myself and it was a good year. :) My lucky number used to be 8, but now it is 4. Both of my children were born on the 4th. One in March and one in August. I think 9 for my birthday month and 24 for a special little person in my life. Thanks for the giveaway! I very much want it a course! :) my numbers - 8 and 13! Fun contest! Mine is 30. My grandfather, husband, mother and sister's birthdays are on the 30th of different months. It sure helps me remember birthdays which I'm known for forgetting. I was born on 23rd of February just like Charissa Struble, how cool. I'm older though, 1970, so my other favorite number is 23. 7! I grew up playing soccer and it was always my jersey number. Funny how those things stay with you - thanks for your contest. LifeBook looks awesome for 2013! What a fun way to give this away ! My numbers are 8 and 11 ... 8 for my birth month .. and 11 because it was my husbands basketball number and I seem to see those numbers around me all the time! My numbers are 3 and 2, i use them alot and i'd like to be 32 again ha! Thanks for the giveaway!! My favorite number is 13, because I've always been a bit of a rebel and marched to the beat of a different drummer. My favorite numbers are 13 because growing up it was the number of my favorite baseball player and now it is my wedding anniversary. I also like the number 3- not sure why except in general I like odd numbers better than even! 5 and 3, 5 my birth month and 3 in my family! How exciting for you to be teaching in what looks like an amazing year-long project! 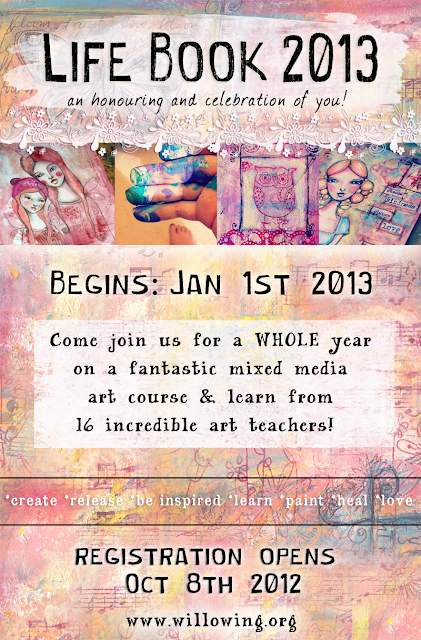 Thanks for the opportunity to win a spot in such a fabulous art journaling project! Numbers 7 and 10 are special to me. My husband was born on 7/10 and my daughter was born on 10/7. I have decided that 2013 is my favourite number because it would be such a great year if I could take part in Life Book 2013 - so here's hoping! 7 is one of my favourite numbers (it is the month of my birth) but I like 18, too. 16 is not a good number for me. Sounds cliche, but 7 has been a lucky number for me and July is my birth month. 7 is also a bittersweet number for me. 15 is also an important number to me because my sister was killed on 7/15. 9 is my lucky number. When I was a kid my lucky number was always whatever age I was at the time. After age nine I just kept that number! I don't know why but I still have it!! :) by the way, I'm 40 now! Lol! 7 is my favorite number and numbers that I see three in a row. Especially 777. I'm loving the number 10 because I'm in my 10th year of marriage. I always thought 'my' number was 7, though I've no idea why - but have come to learn it is '4'. My daughter was born in the 4th month, I was married to my love on the 4th & it's my 'life' number. What a wonderful giveaway! Thank you for the chance! My favorite number is 33 which looks to me like two winged birds in flight. I also love 69 although not necessarily for the obvious reason. I like my numbers to be visual motion. 21 and 12. My son was born on the 21st and my daughter on the 12th (different months). They are so important to me and I love the symmetry of how the numbers are reversal of each other. The number 19 is also significant for my whole family. So many things have happened on the 19th..especially the 19th of August. The main one being the day my hubby & I were married. I was actually 19 When I met him too. But also house numbers. We've lived in number 19's for the past 11 years..finally buying a number 19 of our own. My parents live in number 19 and my sister and her family live in number 19 as well. My lucky number is 22, which is the number of the day I was born. I see that today is October 22nd, so maybe it will prove lucky once again. How great! Thanks for the opportunity! My numbers are 9 and 13. We have a ton of birthdays on the 9th and our wedding anniversary and son's birthday are on the 13th! My numbers are 3 and 5. It came to me really young and I just knew it instinctly that it was a special number 7. I wish I had a better explanation but I found my intuition is my best reason! I would say that 50 is my special number because it has been my best age so far. I never really thought about having any lucky numbers but the numbers 3 and 8 popped into my mind as soon as I read your post. 3 was the number of my favorite pro quarterback when I was in high school (Darryl Lamonica of the Oakland Raiders) and 8 is a vertical infinity sign. I thank you so much for the chance to win a spot in Life Book 2013. It would be great to win but I'm going to sign up whether I win or not--it's an incredible value and sounds like an awesome course!! Can't wait!! the number one in multiples has been following me ie 1:11 and 11:11 still havent figured it out what it means but it has been about a year now following me about! My special number was always 7. I used to love to write it with a little line through it. I used to hate the number 3, but now it is my most cherished number as I have three girls. I never wanted three kids so funny how I know feel it is right and would never change it! So...7 and 3! My favorite numbers are 2 and 7. Not sure why two, maybe a lucky number and 7 because it's the last number in the year I was born, my husband was born (and not the same year as me) and our daughter. Yay! Great giveaway. My numbers are 8 & 3. 8 because it's my birthday number and it's always been lucky for me and 3 as I have 3 children and the best things in my life have always happened in 3's. Mine is 11. My Dad's birthday is Oct. 11, my mom's birthday is December 11 and my birthday is on Feb 11. (all two months apart...different years obviously). 21 is another lucky number probably because 21 is the coming of age number and it's also my birth date. My numbers are 3 and 15. I have always loved the number 3...oddly enough for its shape. I used to doodle it in math class in jr high. 15 ways my sons hockey number and I just liked the way it looks. Asthetics rule me. my fave number is 3. there were three of us growing up and now we are 3 again with myself, my husband and my son. as we celebrated our 15 wedding anniversary we all discussed getting a tattoo representing our love for each other and all that we have been through. we designed a tattoo in the shape of a heart with a peace sign through it and then a three through all of that. we all have it tattooed on our right shoulder as a reminder of our love. have a wonderful day! ciao! How Fun is This!?! My numbers are 22 and 7 - When I was a kid I pretended lots of things, and amongst them that I had magic powers. The number 22 was the most powerful of all because I liked to draw the number itself twice. Later in life I found that in numerology, my name adds up to 22! Seven is just a a quiet favorite. No story! but as you see now i'm alive!!!! my birthday is the 4 of July..
and my mom fav number is 7 and my fathers 4 = it is all about this numbers..
Hi Mindy! Congrats on teaching and have fun-I'd love to join!!! I am so taking this whether I win or not! Looking forward to Lifebook 2013! My number is 8. It was the house number of my childhood home and I have very pleasant memories associated with it. Hi Mindy. I'd say that my special numbers are 1 and 8. They both occur in my birth date as well as fun other place. 27 and 35 have been special numbers I seem to choose - 27 as I was born on the 27th and that seems special to me. 35 - I am not sure why. The number 3 has also been popping up around me lately!? Number 7 is my lucky number but i have no idea why. I just always pick that when asked for my number. Thanks for the chance to win! 8 is my favorite number too. Ever since I was little. I don't know why, really. I LOVE your spirit, your ART, your Instagrams of the new ornaments and the mermaid today...your revealings are precious. THANK YOU. Eleven, 11, is my number. It is said the number represents two posts to either side of a doorway; the door to NEW beauty, the Beauty INSIDE the soul, the true, the self-kindness that echoes with the Creator, the Creative. My number is 13... full of mystery and power... The number many 'institutions' have wanted us to believe was unlucky/cursed etc...A brilliant ruse to turn us away from a magical sweet spot. I get a kick out of 2 and 27 because my son Seth was born on 2/27 at 2:27 and I love the number 7 which always reminds me of God, his care for me and how 7 was the year of Jubilee which everyone was forgiven their debts and this is my seventh year of marriage and trusting all my debts will be gone by December. Yea. Praise the Lord! way to go gal with your generosity. my numbers are 27 and 28 dates of births, father , mother and 2 sisters and dates of passings on of mother and father, also house numbers 28 and 72 which is 27 reversed. My favorite number is 23 for my son's birthday. Thanks for the giveaway!!! I like the number 3 !!! Our anniversary is 3rd of March 1999 so 3 times 3 is 9.. silly but there you go. Thanks for the opportunity to be in the giveaway..lifebook2012 rocked!! I have a lot of triple digits showing up lately: 111 and 555 mostly, I'm fascinated with numbers, how they show up, when they show up... I'm also very curious as to why you set up the contest around people's favorite numbers, do tell sometime! My favorite number is 7. Many moons ago Sesame Street use to have a rabbit with the number seven on the bottom of his foot. He would hold up his foot when Count Dracula got to seven and the number just stuck with me. Lots of symbology around that number. I'm not sure if I'm too late for this (different continent, different time zone)but I just try my luck. As a child my favorite number was 7, for the six most important people in my life plus myself. Now, it is the number 5, for my little family (my husband, our little son, our two furballs, and myself). Eight is my favorite number because it's made of 2 circles. Circles are my favorite shape, so just makes sense to celebrate the 8! No favorite number -- it's always changing depending on life at the moment. Thanks for the opportunity to win!